Out fleet of tanks are of the highest quality and are all available for both short and long term hire at competitive rates bespoke to your business needs. We can offer collection, delivery and service options and a can do approach to ensure you get the most from your hire. Quick acting foot and butterfly valves in combination with 80mm black flanges or 3 inch BSP male screw connections and drip caps*. Airlines with 1.5inch BSP male screw connections with drip caps and pressure gauges*. Digital thermometers accurate to +/-1 Celsius. 500mm diameter stainless steel man lids. We can supply speciality tanks as well as food grade tanks, with or without kosher certificates. 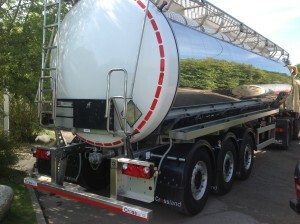 All our fuel tanks bear the 31 a/y markings, are fully compliant with the latest UK legislation and, of course, the European ADR regulations for the transportation of diesel fuels on the road.